Drought is a big issue for any property that has trees and plants, especially here in California where it has directly impacted our usage and consumption of water. 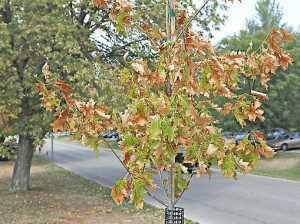 In some cases, it may make sense to plant trees that are more drought-resistant, while other jobs may call for more efficient usage of available resources. The simple installation of a drip irrigation line may be all the preparation that’s needed to streamline your water usage and ensure that you’re compliant with local regulations. Irrigation – Proper irrigation is the cornerstone to managing plant health during drought conditions. Since the amount of water needed will vary from yard to yard, it’s important to have a good understanding of plant needs, local water restrictions, and available options if you are to make an informed decision. Mulching – Mulching is one of the best ways of minimizing damage to trees while ensuring that they have healthy soil and the available nutrients needed for continued, healthy growth. A small layer of mulch on top of soil can go a long way toward helping your soil retain the necessary moisture, as well as attracting beneficial bugs that help protect the overall health of your yard or landscape. Another benefit of mulching is that it helps to suppress the growth of unwanted weeds which could draw vital nutrients and water away from the plants that need them the most. Do you have a yard or landscape that needs to be prepared for dealing with drought conditions? Contact us today at (831) 508-8995 to find out about the many affordable options we have available in Santa Cruz and Monterey counties! All cost estimates are given FREE of charge!